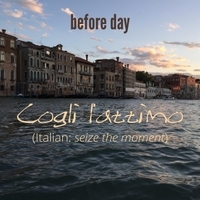 Cogli l'attimo is a song that started out being about Venice, Italy, but it is about life and love and making the most of every beautiful, fleeting moment. Cogli l'attimo is a song that started while I was in Italy - immediately after hearing the bells of Venice resound across the city. I ran into a corner and turned on my voice app and sang the first part of the chorus, "the bells of Venice are ringing, the birds are singing, da da da da da da..."
If you've been to Venice, then I hope this song will take you back there. If you haven't, I hope you will experience a taste of it through Cogli l'attimo. Either way, the song captures some of my thoughts and feelings swirling around me during and after my time in Venice and extends to life and love. Live for the moment. Venice is sinking. The bells are ringing. Take in the beauty all around you for this beautiful life is fleeting and we should take nothing for granted. A MUST-have song for you iPod!! Yet another genius song from Before Day! This is one of those songs you just can't shake.. it's THAT GOOD!! You gotta get this one for your iPod. Experience the world without even leaving your home.. just crank up Cogli l'attimo and you're good to GO!